While some of the most popular horror films focus on delivering visceral scares, whether it's a madman in a mask hacking at victims with a machete or an army of lumbering zombies closing in for a bite, it's always admirable when a movie attempts to present some of those less tangible but just as potent fears: madness, alienation from family members, and the terror of what the human mind is capable of when put under sufficient stress. 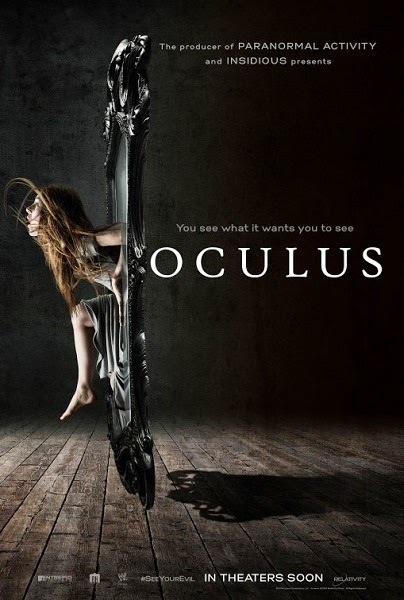 Thus it's a pleasant surprise to find that despite its outward appearance as the former, Oculus is actually an effective example of the later, emerging as a slippery and oddly elegant thriller that's as much about how individuals deal with personal tragedy and trauma as it is about the haunted mirror the plot centers on. After his release from a mental hospital, young Tim Russell (Brenton Thwaites) has accepted that the horrific events of a family tragedy ten years before have a rational explanation. 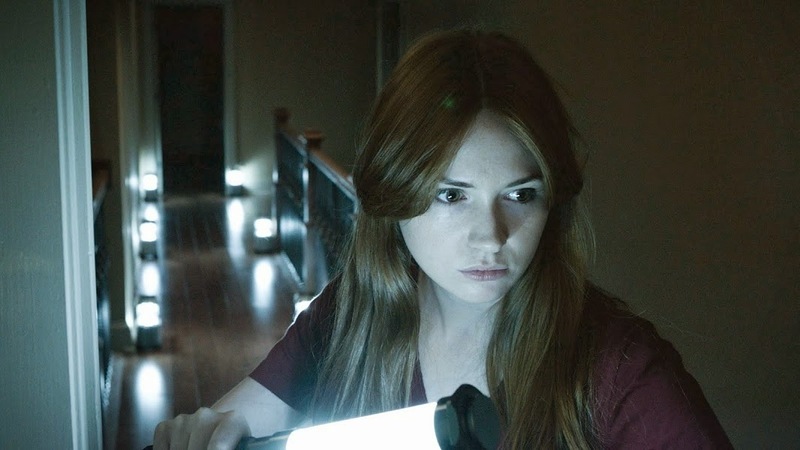 His sister Kaylie (Karen Gillan) remains convinced their shared trauma was caused by an antique mirror that can distort the perceptions of those around it, driving them to madness and violence. Using her position in an auction house to gain temporary possession of the supposedly cursed object, she brings it to their abandoned family home and tries to rope Tim into helping her destroy it. Their story is interspersed with glimpses of what happened in the house ten years before and the grim fates of Kaylie's mother (Katee Sackhoff) and father (Rory Cochrane). It's a straight-forward story told with a refreshing simplicity, as the majority of its events play out in one location between two characters (and their parents in the flashbacks) and are presented in a clear visual style that's atmospheric without being too showy. The narrative structure patiently teases the events of the past and present alongside each other, allowing for maximum tension as each timeline builds to its climax and while informing the other along the way. Superficially, the movie has the creepy ghostly figures and a few moments of dread and shock (including one gag involving an apple that sent a collective shudder through the audience I watched it with) you'd expect from the genre, but happily writer/director Mike Flanagan seems much more interested in the fearful potential of uncertainty. As in Jacob's Ladder and Carnival of Souls, our protagonists are left struggling to sort how much of what they're experiencing is real and how much the malevolent mirror is influencing them, forcing them to second guess their senses and driving up their paranoia. This clever gimmick also handily addresses virtually any plot holes about why the characters don't take certain actions once the situation becomes more dire. But beyond the mirror's alleged abilities to deceive, Flanagan extends the uncertainty onto a wider level by ensuring that every apparently supernatural occurrence might just as easily be the result of shared delusion and hallucination. We never see anything happen outside the main characters' perception that would tip the balance one way or the other and even the flashbacks (based on their memories as impressionable children) are presented as visions experienced by the characters in the present, making their truthfulness questionable. While the story seems to end on a definitive (and arguably predictable) note, there's just enough room for interpretation to keep us unsettled. This ambiguity is best illustrated in what may be the film's strongest scene as Kaylie delivers an oral history of the mirrors' alleged victims to the various cameras she's set up to document events while Tim hammers at her conclusions, attacking with the same rational explanations he's no doubt been subjected to throughout his psychiatric incarceration. Gillan, luminously beautiful and nailing an American accent, skillfully merges the dogged determination of a slasher film heroine with the fragile conviction of a conspiracy theorist convinced that horrific tragedy can't have a simple explanation. Thwaites keeps pace with her, suggesting the conflict between Tim's sympathy for Kaylie and the fear that engaging in her fantasies will draw him back into the mental confusion he hopes to have put behind him. Meanwhile, in the flashback segments, child actors Annalise Basso and Garret Ryan impress as the terrified younger versions of the characters, particularly given how much of the narrative weight falls on them. After watching her portray tough, resilient characters so often, it's more than a bit disquieting to see Sackhoff get put through such physical and emotional torment as their mother, but she and Cochrane present a terrifying portrait of loving parents gone horrifically askew. Plus, if you're a sci-fi geek like me, there's the extra thrill of seeing Starbuck and Amy Pond onscreen together! If he imparts his future projects with the same precision and care, Flanagan may prove to be just the kind of talent the horror genre needs, someone who recognizes that true horror doesn't reside in just a jump scare or a ghoulish make-up, but on a deeper psychological level. Until then, don't let the marketing, which paint this as just another Insidious clone, fool you. Appearances can be deceiving.